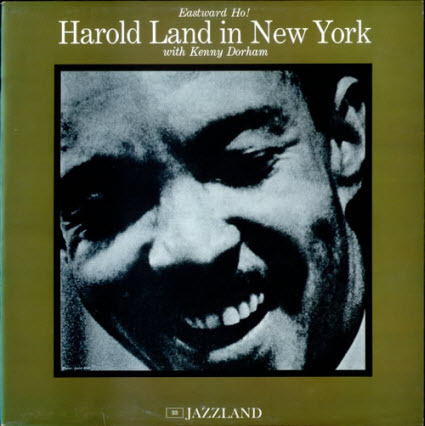 Harold Land was not known too much on the east coast, so to make his presence known he came over to New York in 1960 and recorded this album at the Plaza Sound Studio. There was no better way to express his value than to team up with the great Kenny Dorham and they made the best out of it. “Eastward Ho!” was their end product and it was a total success. Harald Land has a very distinctive sound on the tenor, a very clear and strong sound but with a soft bluesy/intimate touch to it. He could successfully matched up with the very best of them (read biography below). Great album that can rank with many other classics. Harold de Vance Land (tenor saxophonist) was born on December 18, 1928 in Houston, Texas and passed away on July 27, 2001 in California. Land was born in Houston and grew up in San Diego. He started playing the saxophone at the age of 16, and by age 21, had made his first recording as the leader of the Harold Land All-Stars for Savoy Records in 1949. In 1954 he moved to Los Angeles where trumpeter Clifford Brown spotted him, and invited him to join the Brown-Roach band. Land toured with the Brown-Roach Band extensively, and moved to Philadelphia to live with the groups pianist Richie Powell and his brother Bud Powell, but he got homesick, and moved back to Los Angeles a year before the car crash that killed both Brown and Richie Powell. 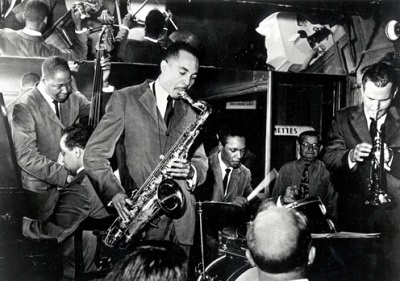 He then became a regular member of another gracefully swinging west coast band, led by bassist Curtis Counce between 1956 and 1958, and with trumpeter Shorty Rogers Giants in 1961.